There is never a good time to get locked out of your car — whether you are on your way to work, leaving the grocery store, heading home from a hike, or simply jumping out to grab the mail. Getting locked out of your vehicle can leave you in a sticky situation and make it hard to go about your daily life. There are even situations when getting locked out can become dangerous. You could get stuck in a bad storm or accidentally lock your child or pet inside. These are situations when you need to act fast! Even if you are not in a situation like this, our team will be able to help you out quickly. At 24/7 Emergency Locksmith in Easton, we can be to your locations as quickly as possible and help you get back into your vehicle. 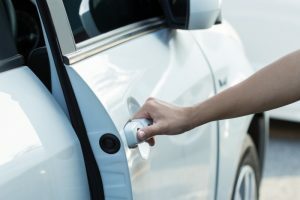 Our team of professional locksmiths provide quick and efficient car door unlocking services, making it easy for you to get back to your routine. When you need your car unlocked, be sure to call us at 484-891-1922. While getting your car door unlocked using a different method may work, you likely will not have what you need if you get locked out anywhere besides your home. When you do find yourself locked out of your car, there are a few things you can try. These include checking all of the doors to see if any are unlocked and trying to unlock the door if your window is rolled down slightly. We suggest never breaking a window or trying your own method (unless you know what you are doing). These methods could result in injury and damage to your vehicle. Instead, contact 24/7 Emergency Locksmith in Easton. We will be to you quickly and get you back in your car in no time!